I entered Trade 22, a long position in gold, all the way back on 22nd June at $1,268, on day 22 of Gold’s 4th daily cycle. Gold’s medium-term Investor Cycle had run 27 weeks and I had expected gold to complete its ICL above the prior ICL in December 2017 at $1,238. 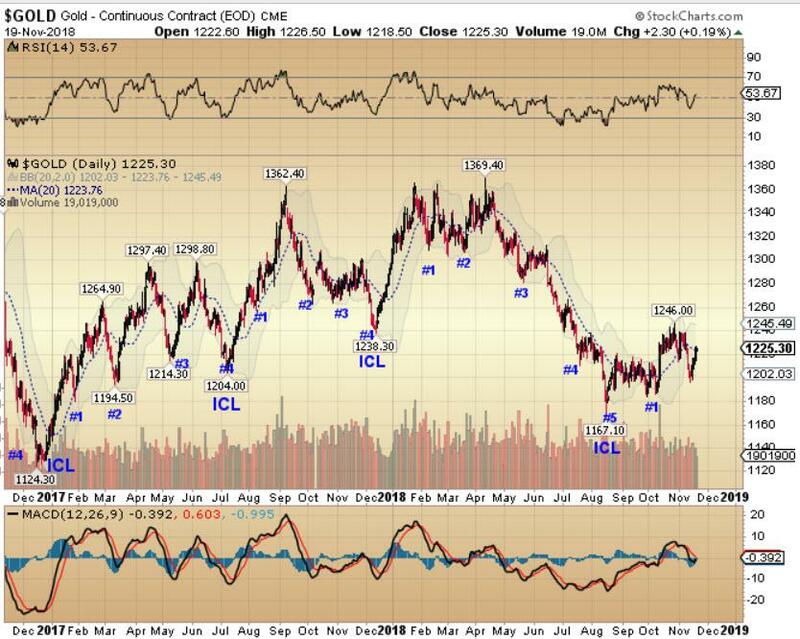 Shortly after entering the position, gold dropped to $1,240, then quickly recovered the full decline before rolling over into a DCL on 19th July. An uncharacteristic 5th DC followed and I had to cut the position in half on 15th August at $1,187 as gold made its final decline into an ICL. I added back the half position I sold a week later on 20th August at $1,190, as gold kicked off a new medium-term investor cycle. DC1 ran 36 days and traded sideways for the majority of that time, building energy while turning the trend from down to up (similar to DC1 in December 2015). DC2 kicked off on 9th October with a strong $50 rally from $1,190 to $1240. The subsequent correction resulted in gold closing below its short-term moving average, leading me to close the position at $1,225. I opened Trade 23 on 31st October at $1,215 but again, following a short pop higher, gold rolled over forcing me to close this position at $1,208 for a loss of -0.5%. After 23 trades, Gold Trader has returned +8.5% and Gold PowerTrader has returned +0.7%. For more information on this exciting new strategy for Secure Investments, or to open an account, please contact Brian Delaney at 086 821 5911 or brian@secureinvestments.ie. Delaney Investment Services Limited trading as Secure Investments is regulated by the Central Bank of Ireland. Delaney Investment Services Limited is registered in Ireland and is a limited liability company. Registration Number: 516058. Registered Office: 76B Northumberland Road, Ballsbridge, Dublin 4, Ireland.